As Mr. Posh Spice and the Galaxy prepare for the MLS Championship, Leaky Pipes looks back and re-evaluates the last 12 months of the Beckham Experience. Photos by Brian Addison. To see all photos, scroll through the gallery above. It is arguably one of Long Beach’s most underrated spaces—but for those that know and love this little 1.3 acre of land, it is a genuine Long Beach wonder, becoming home to wedding shoots, parties, and simple escape from the hubbub of urban living. Dedicated in April of 1981, the garden was built through the donation of Loraine Miller Collins via the Miller Foundation. 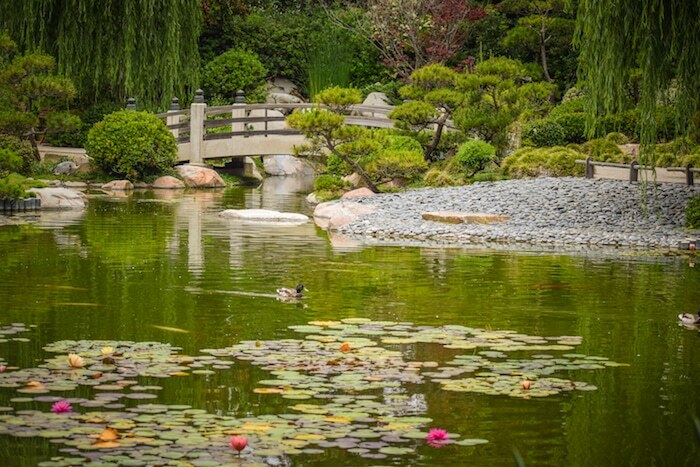 Created in memory of her late husband, Earl Burns Miller, three years of planning brought Long Beach landscape architect Ed Lovell to design the garden. Lovell traveled Japan for months in search of creating a synergy that would transport those in Long Beach to the countless gardens he visited in the land of the rising sun. 35 years later, Lovell is entirely right. Japanese black pines, maples, and ginkgoes pruned in the ueki style provide visitors one of the most relaxing and distinctly unique experiences in Long Beach. Announced earlier this year, the garden began charging admission for the first time in the name of preserving the space. “Our goal in making this change is to improve the sustainability of this beautiful, educational and cultural resource for the enjoyment of future generations,” said Jeanette Schelin, the garden’s senior director, in a statement.